This regulated first aid qualiﬁcation is speciﬁc to infants aged under 1, and children aged from 1 year old to the onset of puberty. Where this qualification is undertaken in less than 22 hrs, additional learner instruction may be undertaken through reflection, research i.e. Internet, reading or work based activities. mework for the Early Years Foundation Stage (EYFS) as issued by the department for Education and Skills Foundation Stage relating to Early Years childcare. 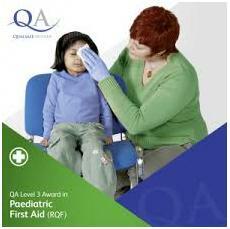 This Level 3 qualification is an extended version of the Emergency Paediatric First Aid. Also approved by the Association of First Aiders. Emergency Paediatrics First Aid is a regulated qualiﬁcation speciﬁc to infants aged under 1, and children aged from 1 year old to the onset of puberty. It is ideal for parents and babysitters. The AoFAQ Emergency Paediatrics First Aid is a stand alone qualification, it also forms Unit 1 of the AoFAQ Paediatrics First Aid qualification. Where Unit 2 is completed within 10 weeks, this qualifications can be converted to the AoFAQ Paediatrics First Aid Qualification. Note: The AoFAQ Paediatrics First Aid qualification is suitable for school staff, childcare providers, childminders in schools, nursery schools, pre-schools and staff involved in childminding. It fulfils the requirements of the statutory framework for the Early Years Foundation Stage (EYFS) as issued by the department for Education and Skills Foundation Stage relating to Early Years childcare. 1. Understand the role and responsibilities of the paediatric first aider. 2. Be able to assess an emergency situation safely. 3. Be able to provide first aid to an infant/child who is unresponsive and breathing normally.